Make learning how to read tons of fun for your students. 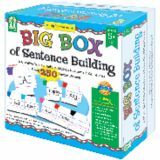 Improve sight word recognition, develop vocabulary, increase fluency, teach punctuation, and introduce grammar with the Big Box of Sentence Building! The 250 puzzle pieces (approximately 2" x 2") also include four blank puzzle pieces that students can use with write-on/wipe-off crayons or dry erase markers. The pieces are also color-coded by the part of speech they represents. The game includes a 4-page booklet with directions, teaching suggestions, and games. The games include Scrambled Sentences, Spinner Game, and much more. It also supports NCTE standards. 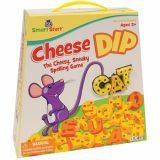 Introduce word families, initial consonants, initial consonant blends, and digraphs by creating fun two-piece word puzzles! 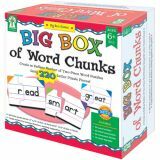 The Big Box of Word Chunks includes 220 puzzle pieces (approximately 1.25" x 2.25") that are color-coded according to the vowel sounds in the word families and the beginning sounds. 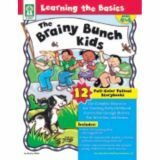 This learning game includes a 4-page booklet with directions, teaching suggestions, and activities. Activities include Races to Build Words, Walking Words, and much more. It also supports NCTE standards. 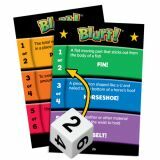 Best-selling Blurt!® gets a make-over: brand-new box and game board, and even better party-ready game play! What word means “a partially dried grape?” Be the first to say “raisin” and you're on your way to winning this riotous game of rapid word recall. Sounds simple, but as the race for the right word heats up and the blurting gets boisterous, it's easy to get tongue-tied! 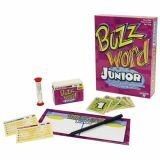 The Game that Fuzzes your Memory and Buzzes your Brain!™ This lively game will have everyone buzzing! You and your teammates have 45 seconds to solve a set of clues where all of the answers contain the Buzzword. 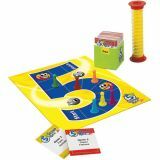 Includes 380 sets of clues, scoring cards, sand timer, scoreboard, marker, and rules. 4 or more players in teams. 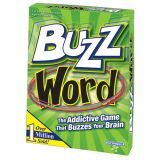 The Game that Fuzzes your Memory and Buzzes your Brain!™ This lively game will have everyone buzzing! You and your teammates have 45 seconds to solve a set of clues where all of the answers contain the Buzzword. Includes 288-400 clues, scoring cards, sand timer, scoreboard, marker, and rules. 4 or more players in teams. Action-packed games build reading and vocabulary skills! 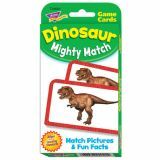 Players match picture to picture or picture to Fun Fact cards to win. Realistic dinosaur images, interesting facts, and extra challenges present tons of fun for everyone. Ideal for school, home, and on the go. Includes 54 Game Cards and 2 Activity Cards. Individual and Group Play. 56 cards, 3⅛" x 5¼". 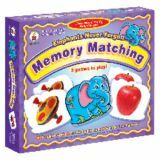 Elephants Never Forget is a fun memory matching and classifying game that is perfect for 1 to 3 players! Children flip over the cute elephant cards to discover and match photographs of food, toys, and animals. The set includes 36 durable cards, a two-sided game mat, and game directions in English and Spanish. A chilly pass-around wordplay game! Challenge the whole class to a category countdown!